Opcom is convinced it can make a farmer out of anyone. After seeing GrowBox at a CES event, and learning about GrowWall, it certainly piqued my interest in at-home (and indoor) gardening systems. Hydroponic gardening systems have been around forever. Chances are, your parents probably smoked some expensive weed back in the 70s that was grown hydroponically. 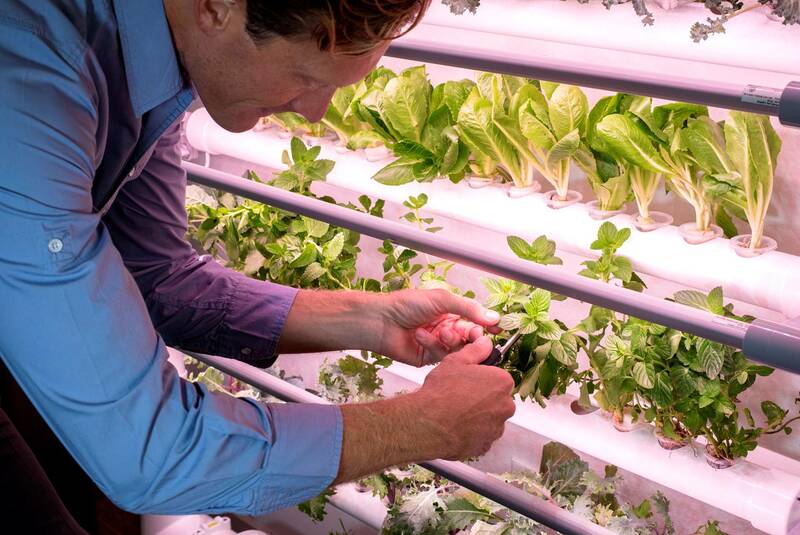 Put simply, a hydroponic system means a plant is grown without soil, and typically with artificial light. Since the grower controls everything from light to PH and nutrient levels, it leads to a remarkably consistent plant time after time. Outdoor gardening, on the other hand, is vulnerable to weather, garden pests, and soil that might be depleted of nutrients. 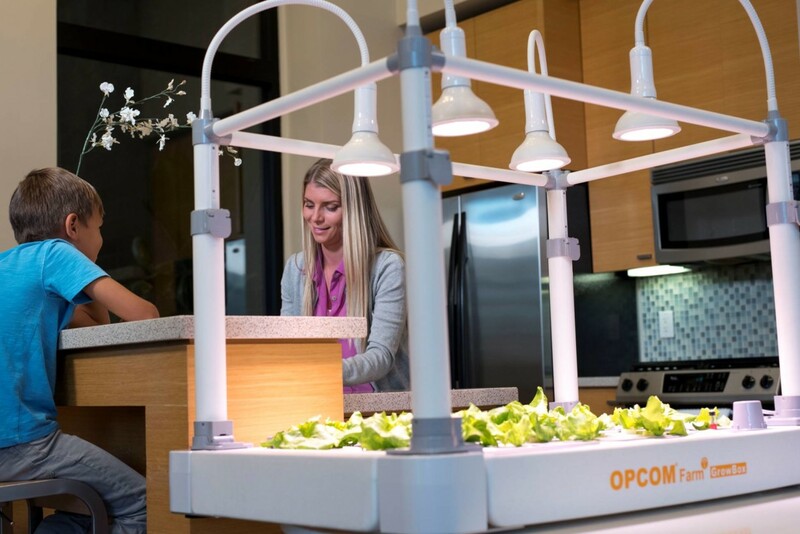 Opcom has two products designed to make growing your own food easy, and affordable. Gone are the high intensity grow lights and the complex understanding required to harvest a palatable crop. Replacing them are high-efficiency (and low wattage) LEDs, and a programmable brain that tends to everything from water to nutrient levels. Oh, and there’s no dirt. If you have the space, you can grow this right from your kitchen table without fear of mess. GrowBox, a table-top garden, was on display at CES. While checking it out I learned about its larger sibling, GrowWall. The former is capable of growing 50 separate plants from a table-top, while the latter can handle 75 while requiring about the same amount of space as a bookshelf. Both report 25 percent faster grow times than traditional gardening methods and each can handle a multitude of plant types. I think most of us would like more control over what we’re eating, but growing our own food is typically too labor intensive, requires too much space, or means we actually have to read a bit about gardening before breaking ground. 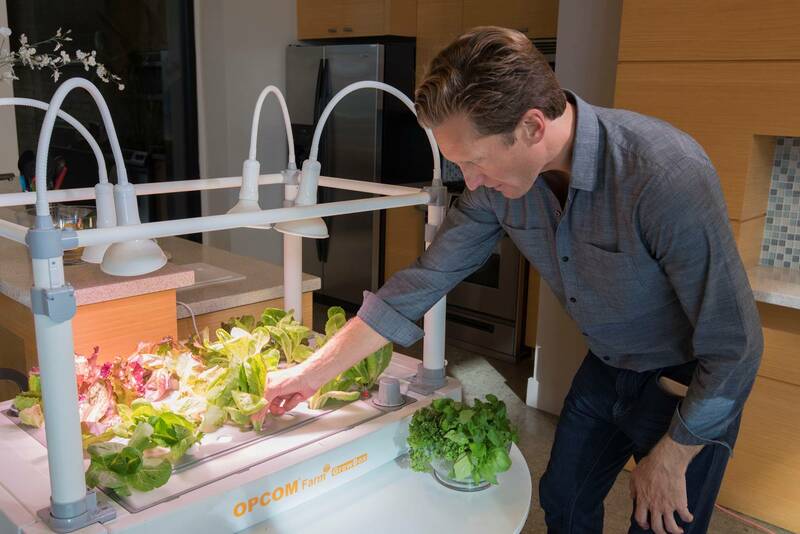 Opcom’s systems handle the heavy lifting and leave us with an in-home farm to table experience. Both are available now. You can grab GrowBox for $499, or GrowWall for $599 at Opcom’s website.